Peel, slice, and dice fruits and vegetables with precision with this Victorinox 47501 4" spear point paring knife with large black nylon handle! While this knife's straight edge is perfect for chopping ingredients, its spear point design allows you to pierce through thick crusts or skins with ease. Plus, the handle's contours ensure that the knife will fit comfortably in your hand as you tackle small, daily cutting tasks. These are great paring knives for the kitchen! We cut up berries everyday multiple times a day and these suckers are nice and SHARP! I ordered 2 on the first order however I will order more when needed! A 4 inch spear point paring knife is a staple in all kitchens, and this Victorinox version is truly outstanding. The nylon handle is easy to sterilize and the blade is easy to keep sharp. What more could you ask for?! Victorinox quality in a 4" paring knife. The blade is fairly thin for laser like cutting with a nice sharp edge, and easy to hold plastic handle. I love this knife! I bought it for personal use and have had zero regrets. It stays very sharp, cuts meats and veggies like butter and is easy to use, easy to clean and is made of excellent quality. Excellent value! Great longer paring knife. I use this one for mango to slice fruit from the pit and to peel. It is comfortable to hold in the hand. Worth purchasing multiple of these! These are great paring knives, and WebstaurantStore carries them for the most affordable price I’ve found online. I use these at home and at the shop everyday. They keep a relatively good edge and are the perfect size for a paring knife. This is a great little knife. I use it for task that I would like to avoid using my more expensive paring knifes for. Don’t let the price fool you...this knife performs! Great knife. Holds the edge well. Not seeing any rust or stains developing on metal. Handle is on the thin side and knife is light, but that is by design. I have this knife in 3 1/4 version as well; both excellent paring knives. I bought this knife because it was a good price and said to be dishwasher safe. It's very sharp and seems to be working well for us. This knife's purpose is quite universal. I use this knife for pretty much everything I decide to cut and it does the job and then some. It does a perfect job on cutting everything I have tried and it has been pretty much everything. I would recommend! I love Victorinox knives. The 4" spear point paring knife is great. It is a nice thin blade that is still strong and will keep it's edge. I love the Victorinox brand. Their knives are consistently great and hold a nice edge. This 4" spear point paring knife is great to have around the kitchen. These are some really great multi purpose knives. I mainly use them as steak knives, they stay super sharp and are extremely easy to maintain. I was surprised at how nice this knife was and how well it holds an edge. I bought one of these in the 4 inch size and in the 3 and 1/4 size. Both perform very well, and are a pleasure to use for different tasks. The four inch paring is perfect for everything. This is my favorites size and Victorinox is my favorite knife brand. The blade is thin so it makes slicing quite easy and also helps when sharpening the blade. Great quality knife. A must for every kitchen. Does the job of big knives without the heavyness. It is an excellent multi-purpose knife to have. This is a great all-purpose paring knife. The handle is easy to grip and doesn't slide in your hand, even when wet. Great for cutting fruit/produce! I'll be getting a couple more for sure. Great knives. Had a knife professional what knife to buy, and he told me to by this brand if I find it. It's worth paying extra. This knife is extremely sharp, so be careful! I was pleasantly surprised at the quality considering it was so inexpensive....It cut through a lemon like butter. For the price, you can't beat it! Great knives, all around. Good handles, good blades, good price. I can only recommend them. The length is a bit longer than I am used to for a paring knife, but I am happy. Such a workhorse! This knife is the perfect size, easy-to-use, sturdy construction, and super compact and easy to store. Love using it for detail work and cutting any kind of produce. Will definitely buy again! 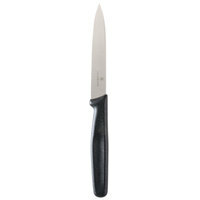 This Victorinox paring knife is great, they are nice and sharp easy to handle and very versatile. Must have around the kitchen for practically any use! My Victorionox paring knife came out of the box razor sharp, and held it's edge for quite a while before I even considedered sharpening. it works wonders for small jobs, and it shares some of the features that I love about the Victorionox chef's knife, especially the textured handle. This knife is my most favorite paring knife in my kitchen, and I have many. The handle is nonslip which is very helpful in preventing accidents in the kitchen. The best part however, is how sharp the blade is. It can cut ripe tomatoes smoothly and easily. I use it for almost all my small chopping needs. The quality of this knife is amazing for the price. THE Victorinox 47501 4" Paring Knife is another WOW for the company. You can't beat Victorinox for any of their knives. I bought eight of these and we are using them for steak knives as well as paring knives. They are sooooo sharp, they cut through baked potatoes like they were just boiled not baked. The handles are a little small for my liking but you can't beat the value. Just received these knifes, but they have already become a favorite. The 4" length makes them very useful for lots of cutting chores and they are very sharp right out of the package. Plan on switching to Victorinox for all my paring knifes. This is my fifth Victorinox knife. Like all the others, this one arrived razor sharp and in good condition. The handles are a bit small which makes these lightweight but they don't feel cheap at all. The 4" length is just about right for most things I do. I also have a 3.25" paring knife and it is a bit short some times. Fantastic knife! Extremely sharp and it stays that way. It is nice and small and can be used for practically anything, you will not regret this purchase!!!! This is a terrific little paring knife. The grip is comfortable, and the edge is sharp. I haven't tried to sharpen it yet, but it's high carbon stainless and should take an edge quite well. I needed a paring knife and was looking for a nice, inexpensive model. This paring knife has been very useful for me as I have used it. Would definitely recommend! Super sharp, easy to use, comfortable to hold, and super cheap. Does what it should for a great price. NOt much more to say about it. Good product. I have seen cheaper paring knifes of different brands in the internet but of unknown quality. This Victorinox are sturdy and of good quality. The best paring knife on the market. Inexpensive and reliable. Keeps an edge and is comfortable to use. Buy extra because everyone will love them! This is a great knife that can be used to cut just about anything. I use it predominately for fruit. Victorinox is a great name in knives and at this price you can order a couple. You can never have too many. What a wonderful knife for the price. I use it to cut brownies, score warm chocolate and to quickly cut off cling wrap that i've stored cake layers in. This is actually a really nice kife. I buy them all the time. Its good because its really cheap and I pretty much dont sharpen them. Instead of putting a new edge on I just grab a new one!